Almost as daunting as collecting Disney memorabilia in general is collecting Disney theme park merchandise. After all, Disneyland has been merchandising itself consistently for 57 years. If you visit a Disney theme park these days, you might notice that pretty much everything in the parks is created by Disney for Disney… which means all of the profits stay within the Disney Company. You can’t blame them for marketing their theme parks like this. After all, most of us visiting Disney theme parks are looking for exclusive merchandise advertising our favorite characters and rides anyway. Though Disney has always carried exclusive merchandise based on rides and characters, in the early days of the parks they did bring in some outside merchandise that fit in with the theme of Disneyland, but wasn’t directly based on anything Disney. Great examples of this are the Randotti skulls. If you are like me, your first thought at reading the company name “Randotti” is that it is an Italian company. It seriously sounds like an Italian name to me. The company was actually created, however, by the Smith’s. That is, Randy and Dotti Smith to be exact (Get it? Randy and Dotti … Randotti. It makes sense). I could regurgitate the history of the Randotti Company, but the best way to learn about Randy Smith is to read his biography here on a website created by Randy’s son that is dedicated to the Smith family legacy. The story of this small company is amazing to me. They made a sustainable business out of creating souvenirs for Disneyland, and Disneyland only (later Disney World as well). It just goes to show how successful Disneyland was. Randotti skulls come in several different sizes, and some are even a little bit more specific to rides in the parks. For example, there is a skull with an eye patch made for Pirates of the Caribbean. The company also produced tikis, statuary, and tomb stones for The Haunted Mansion. When I first learned about Randotti skulls, I thought that they didn’t start selling them in the parks until the creation of Pirates of the Caribbean and The Haunted Mansion, but they began selling souvenirs in the parks in 1956, just one year into Disneyland’s existence. 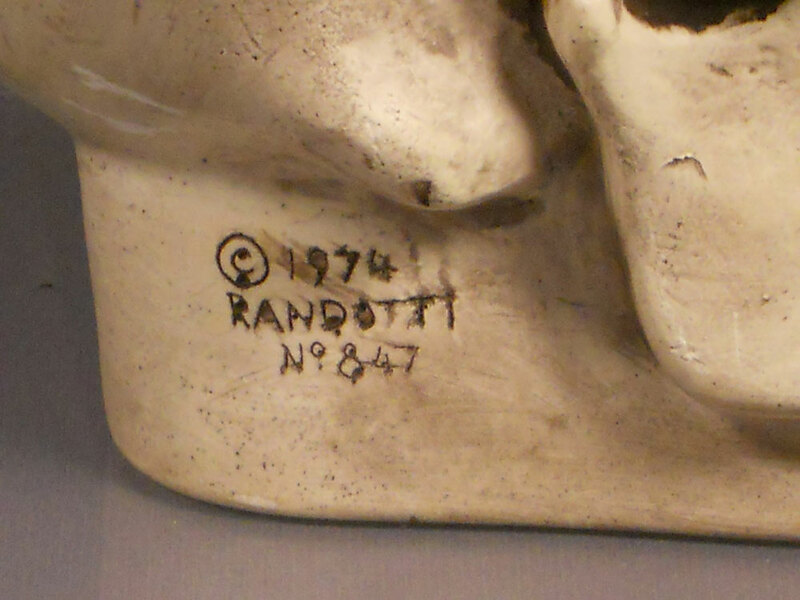 The earliest Randotti products are marked only with an “rj”, but the late 60’s skulls forward are very clearly marked and dated. I think these skulls are beautifully sculpted and cast, and I can understand why they were so popular as souvenirs, and why they are still highly sought after today. I have to admit, though, I can’t imagine carrying one of these around the park with me all day. The skull I have is just shy of being life sized, and is cast in solid plaster. I actually weighed it, and it’s about five pounds. I know that isn’t that much, but still, it goes to show that people liked these things so much that they would slightly inconvenience themselves by carrying a five-pound weight around Disneyland all day in order to own one. 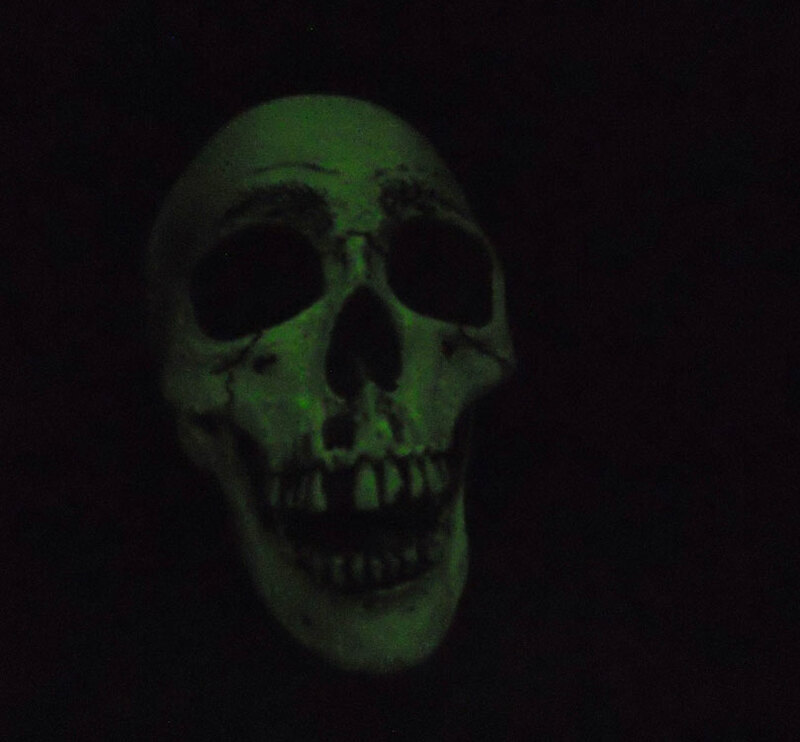 One of the coolest features about Randotti skulls is that they glow in the dark, and the glow feature works as well today as it did in 1974 when my skull was created. I can only imagine how cool it must have looked to see an entire display of these guys in a souvenir stand at Disneyland at night. Randotti products are highly sought after today by Disney theme park collectors, especially with collectors of Pirates of the Caribbean and The Haunted Mansion. They may not be based on any specific characters or attractions at Disneyland, but for those who visited the parks between 1956 and, I believe, sometime in the ‘80’s, they were a very memorable staple of the souvenir stands in Adventureland, New Orleans Square, and in the Main Street Magic Shop. Randotti souvenirs are a rare example of Disney theme park merchandise created by an outside source that are just as highly prized as many of the official Disney products of their day. This entry was posted in 1950's, 1960's, 1970's, 1980's, Amy, Disney, Monsters, Weird. Bookmark the permalink. And for a Hallowe’en display…WOW!! Waaaaay back in 1975 when I was 10, my parents took me to Walt Disney World (still the coolest thing ever done for me!) After riding Pirates of the Caribbean, I came face to face (er, skull?) with the Randotti skull pictured above. I HAD to have it. I spent my hard earned allowance on it, and yes, toted that 5 pound head all around the park. I recall my family laughing at me, telling me that I’d be pulled off the plane for transporting a human skull! 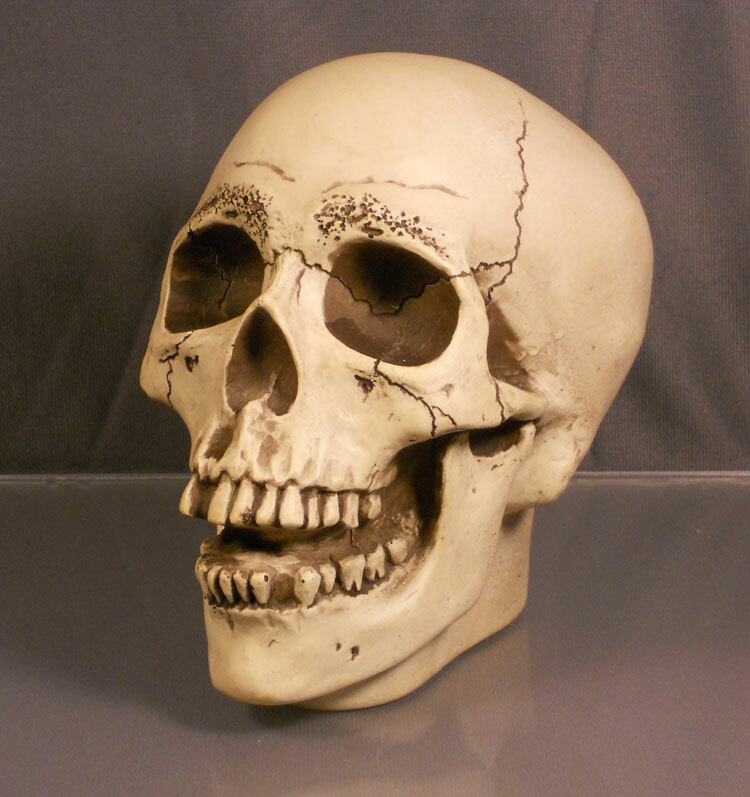 I still own my skull, although it’s suffered a few chips through the years. I love it, and while I used to display it only at Halloween, I keep it out all the time now, as I’m a HUGE Pirates of the Caribbean and Haunted Mansion fan. It’s a great item – heavy duty. No cheap plastic junk. I’m glad that there are others that recall that great skull from back in the day. where can i purchase one of the skulls today? They don’t sell them in the parks, so your best bet is eBay. You might get lucky like I did and find one in the wild though. 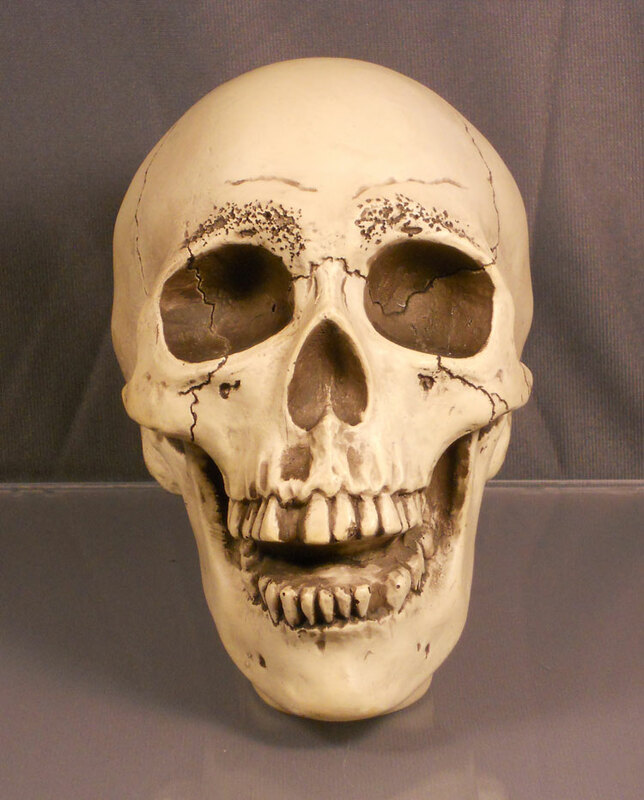 I am selling my 1967 IVAN skull with the tag still intact if you’re interested. Ebay is the best source for the collectable Randotti’s. There is actually a woman on there selling brand new old stock. They can be pretty pricey though. There are a few people (myself included) who create new skulls cast from the original Randotti molds. They aren’t really collectable in the same way in that they were not made by the Randotti company. However if you are more interested in the design rather than collectable value, it can be a more affordable alternative. I have a 1974 Randotti Skull # 847 for sale asking $225.00 for it. If you would like pics of it email me and I will get back to you. I had two skulls from Disney world (circa 70’s I believe). And they were awesome. They were about the size of a good sized mans fist,they glowed in the dark,and they had hair. One had long white hair,and the others hair was darker,but braided into pig tails. They were made out of rock. One day I brought them over to show my friend,who I partied with for about sixteen years.lol He had a black leather spike studded belt and matching wrist belt/band. We took one head and folded the belt around it,then secured it in place with the belt/band,then the other head on top of it securing it with the belts own hooks. Then we put it on the rear view mirror. IT LOOKED AWESOME!!. Until some scum bag stole them. Well,my friend was in a wheel chair,and one night it was taken right in front of him. I think the mirror went with the skulls. Needles to say I was not there. He is dead now at 44 years old,it was back about two weeks before the greatest upset in football history. When the New York Giants took down the undefeated New England Patriots. It was how I knew that New York was gonna win it,my buddy was from New York,and it was his luck to have crap like that pan out that way. So just know,some body died for that impossible victory. In case you were rooting for the Patriots. Well,any ways,I was wondering if any body out there knows what Skulls I am talking about. If only to see a picture of them again would be a Godsend down memory lane. I have searched the web to no avail. ( The skulls were my sisters,so they could be older). HAHAHA!!! I left this window to search under Randotti,and I found one. Now I just need the pic of the one with the pig tails. LOL Just in case any one wants to see what I mean,I will leave a link for the pic. The skulls you are referring to were known as “Ivans”. They came with several different colors of hair and two different variations of skulls (one with forehead damage, one without). They never came with ponytails or pigtails, so I’m guessing your sister was probably having some fun braiding them. I can provide you with more photos and information if you would like. I reproduce Randotti products with original molds, and have studied their catalog and products extensively. I have a 1967 R. Smith Ivan the hairy one glow in the dark skull that is in excellent condition with the tag still intact, and it still glows perfectly. Found this in my dads antiques. I would like to know any information on it, and how much I could sell it for as I plan on posting it to ebay to sell it. Here are some pictures of it. I have a Randotti skull with the eye-patch on the right eye. I bought it at a garage sale in 1994. It has been sitting on my desk ever since. I discovered the glow-in-the-dark quality by accident. As I recall, I paid 50 cents. Wow, awesome buy! I hear about such finds but haven’t stumbled upon one yet. Well played!